Robust flavors of black truffle flow throughout this mixed milk cheese. 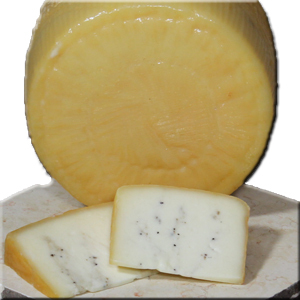 Distinguishing notes of Italian black truffle combine beautifully with buttery cows milk & rich goats milk in this semi–hard Asiago style cheese aged 45-90 days. Available in a 6# wheel. Excellent in a mac and cheese. Great melting cheese. It takes quality milk to make quality cheese, and the family of Nicolau Farms has been doing just that since the early 1900’s. Their farm is located in the fertile San Joaquin Valley, allowing them to produce some of the finest farmstead cheeses. Nicolau uses an older method of pasteurization that does not impart a cooked flavor on the milk.